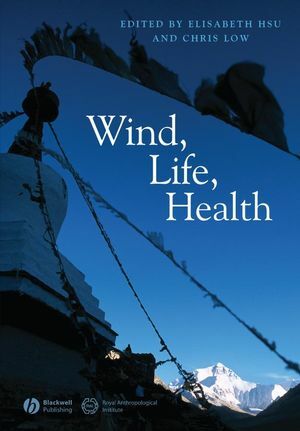 Published as part of The Journal of the Royal Anthropological Institute Special Issue Book Series, and through a series of thought-provoking articles, Wind, Life, Health: Anthropological and Historical Perspectives examines the richness of human ideas surrounding wind in all its manifestations - breath, spirit, sentiment, life, and health. Elisabeth Hsu is Reader in Social Anthropology, Convenor of the Masters courses in Medical Anthropology at the Institute of Social and Cultural Anthropology of the University of Oxford, and Fellow of Green College. Her current research on Chinese medicine explores themes of touch, pain and feelings. Chris Low, a postdoctorate at Oxford, holds an ESRC Research Fellowship and is currently involved with research on the changing relationships between animals, Bushmen, and Bushman medicine. Preface (Elisabeth Hsu and Chris Low). Introduction (Chris Low and Elisabeth Hsu). 1. Earth, sky, wind, and weather (Tim Ingold). 2. Wafting on the wind: smell and the cycle of spirit and matter (David Parkin). 3. Blowing 'cross the crest of Mount Galeng’: winds of the voice, winds of the spirits (Marina Roseman). 4. Khoisan wind: hunting and healing (Chris Low). 5. Time to move: winds and the political economy of space in Andamanese culture (Vishvajit Pandya). 6. The bodily winds in ancient India revisited (Kenneth G. Zysk). 7. The experience of wind in early and medieval Chinese medicine (Elisabeth Hsu). 8. Pneuma between body and soul (Geoffrey Lloyd). 9. Gruff boreas, deadly calms: a medical perspective on winds and the Victorians (Vladimir Jankovic). 10. An ill wind: the Foehn in Leukerbad and beyond (Sarah Strauss). Through a series of thought-provoking articles, Wind, Life, Health: Anthropological and Historical Perspectives examines the richness of human ideas surrounding wind in all its manifestations - breath, spirit, sentiment, life, and health.